Reggie Howard played for six years in the NFL. He played for the Miami Dolphins and the Carolina Panthers. He is retired from the game and is now helping out other athletes by empowering then to impact communities through education and social development. Along with Ray Lewis, Julius Erving and others they are looking to make a difference in their communities with the United Athletes Foundation. They are having a raffle where you have a chance to win a trip to New York City to meet Ray Lewis during NFL Draft weekend at various VIP events! The deadline to enter is April 23! Click here for more details. The United Athletes Foundation is a 501c3 public non-profit organization created in 2008 by a group of professional athletes who understood their unique role in improving the lives of both the athlete fraternity and society in its entirety. To date, there are more than 90 professional athletes associated with the UAF including members of the NFL, NBA, MLB, WNBA and professional boxing. I was able to chat with Reggie about the NFL Draft weekend promotion, the UAF, and football. Art Eddy: Tell me about the promotion you have for your foundation, the United Athletes Foundation and how it revolves around the NFL Draft weekend. Reggie Howard: We have a nice promotion for the fans. For the past four years we have been working events at the NFL Draft weekend with players become of aware of financial security. We also have an award ceremony where we give an award to the MVP of the community. So this year we thought it would be great to have this promotion where we put out a raffle where one lucky fan can have the opportunity to attend the event with an all-expense paid trip to New York City and bring one guest to hang out with the UAF. We have been getting the word out about and people are getting excited. This year we have one of the key members of the United Athletes Foundation, Ray Lewis and he is the key spokesperson for this. The winner gets to spend time with us and see what our foundation does and how we help out the community. 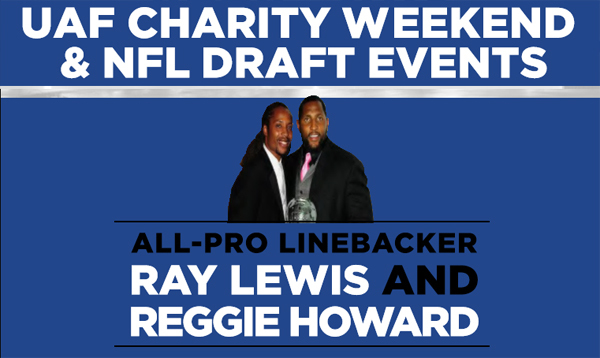 AE: You are working with Ray Lewis for this promotion with the UAF for the NFL Draft weekend. How is it to work with Ray for this promotion? RH: Ray has been great. He is actually one of the co-founders of the United Athletes Foundation and is also the chairman. He is a guy that really cares about the community and has a big heart. One of the main things that we focus here in our organization is to let guys know how important it is to be community leaders. The second thing is that the NFL is great, but there are things outside of the game that we really need to have a focus on and that is family, community, and a great understanding as it pertains to financial literacy. That is one of the big things in our organization. We need to put things in place where guys have resources where they can learn more about finances. They can also learn to be protected from fraudulent financial activity from advisors. It is a great weekend because we have great events planned. We had Jim Brown pass the torch so to speak to Ray and one of the people we are thinking of presenting the MVP award to is Adrian Peterson. He is a great guy that is not only a stellar player on the field, but also has a big, big heart for his community. UAF is all about team concept in the world of philanthropy and showing the importance of what our responsibility is to the community. AE: In your NFL career you played mostly for the Panthers. Looking back at your career what stands out the most with your time in the NFL? RH: I really enjoyed my time playing in the NFL. It was a great experience. I would say the biggest thing is the camaraderie of playing with players and competing on the top stage. Playing in the NFL is going up against the best of the best. Every day that you go out you are competing at your highest level. One thing coach (John) Fox told us is that if you are not getting better you are getting worse. Nobody ever stands still. It is a true statement. Anytime that you are not putting forth your best effort you give an opportunity for your competition to get better. For me it was definitely the camaraderie of it. The highlight was playing in the Super Bowl. There is no feeling like that. To be on stage where all eyes are on you and you are trying to win a championship. Not everybody gets that opportunity and when you get there it is a special, special moment. AE: Speaking of Super Bowl XXXVIII, you and the Panthers fell short of beating the New England Patriots. You did intercept Tom Brady though not that many people can say they did that. Do you remember that play? RH: You remember everything you did in that game. It was funny because when we were preparing for the Patriots it was very hard. They had so many packages out there offensively that you never knew what they were going to do. They had so many things that they could do as an offense that it was hard to prepare for them. It is hard for a defense to pick up tendencies on teams like the Patriots. That is why they are so successful offensively. On that play that I got the interception on is funny because that is one of their key plays and key formations that they run. This was one formation that we prepared for that week. They like to have trips on one side and two receivers on the other side. They like to run double smashes from the outside receivers and have the inside receiver run the seven route to the corner. I basically recognized the formation. I played it where I led Tom believe that I was going to man to man and then I actually backed up and I got the interception. I got tripped up by one guy and if not for him I could have taken it all the way. Muhsin Muhammad took it to the house after we got the turnover and helped us with gaining some momentum. It was a great game and it came down to the wire. We are not the only team to lose to the leg of Adam Vinatieri. (Laughs) After that the NFC Championship ring went back in the closet and I didn’t want to see anything with a Patriot sign on it. It is no fun being second place at the Super Bowl. AE: Playing cornerback is tough since you are going up against some great athletes. Who was the hardest wide receiver to cover? RH: I would have to say Randy Moss. At that time he was playing in Minnesota and that guy was tough to cover. He was well feared by players back at that time. AE: Who talked the most trash? RH: Keyshawn Johnson by far. Keyshawn talked a lot. I would say looking back it had to be Keyshawn. That guy was always talking. Print article This entry was posted by Art Eddy III on April 20, 2013 at 2:26 pm, and is filed under Sports. Follow any responses to this post through RSS 2.0. Both comments and pings are currently closed.